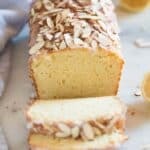 Lemon Almond Bread is a delicious and easy quick bread recipe with hints of lemon and almond flavor, topped with a sweet glaze and sliced almonds. 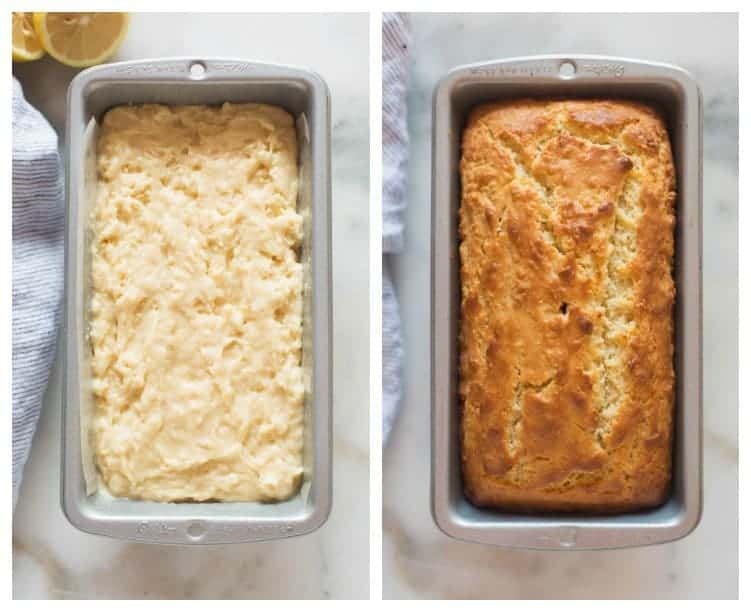 One baked good that is ALWAYS a huge craving of mine is homemade quick breads. I could eat a slice of banana bread every single morning (especially if it’s this skinny banana bread!) . I sometimes categorize my favorites by season. During the summer it’s lemon zucchini bread, and almond poppyseed bread. During the fall I love this cinnamon applesauce bread, pumpkin chocolate chip bread. And during the winter and Christmas season I just can’t get enough of this Cranberry Orange Bread! But let’s be honest, homemade sweet breads like this lemon almond bread get my vote all year round. And, even though quick breads are one of my favorite things to bake, they are one of my least favorite store-bought bakery items. You know how the grocery store has them sliced, usually with a few different flavors, in a take-away container? They always sound and look appealing, and then I taste one and it’s always either overly sweet, dry, or boring. Just not worth the calories, you know? But homemade quick breads. Oh ya —> amazing. 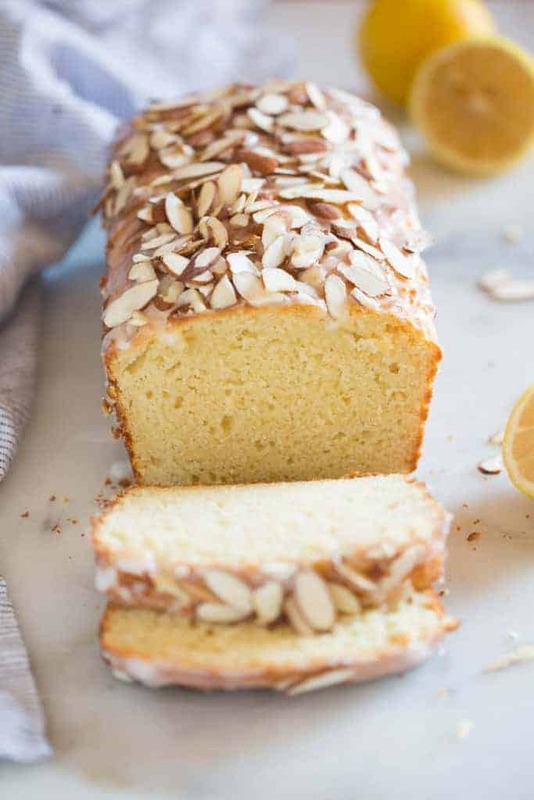 You may be shocked at how easy it is to make this lemon almond bread. Simply sift the dry ingredients in one bowl and cream the butter and sugar together in a separate bowl. Add eggs, lemon zest + juice, almond extract, almond milk, and sour cream to the wet mixture. Slowly stir in the dry ingredeitns and pour this mixture in a bread pan. Bake it at 350 for 40-50 minutes and top with yummy glaze! I love the flavor combination in this almond quick bread. The almond milk adds an extra “nutty” flavor that I love, but you could substitute it for milk. This recipe makes one 9×5” loaf. 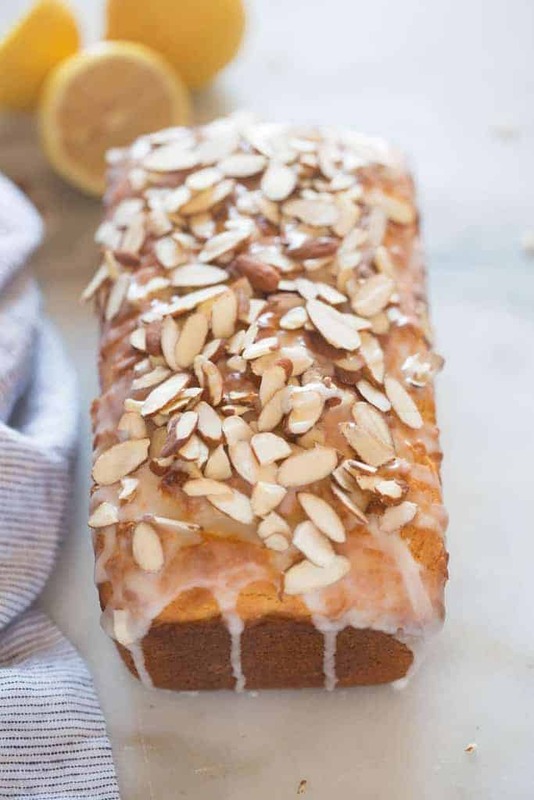 Lemon Almond Bread is a delicious and easy quick bread with hints of lemon and almond flavor, topped with a sweet glaze and sliced almonds. Preheat oven to 350 degrees F. Grease and flour a standard 9x5'' loaf pan. In a small bowl sift together flour, baking powder and salt. In another large bowl cream together the butter and sugar. Add the eggs and mix. Add zest and juice from one lemon, and almond extract. Add the almond milk and sour cream and mix. Slowly stir in dry ingredients, just until combined. Pour batter into prepared pan. Bake for 40-50 minutes or until a toothpick inserted in the center comes out clean. Remove to a wire cooling rack to cool completely. Mix together glaze ingredients until smooth. Drizzle over the top of the cooled cake. Sprinkle with sliced almonds. This recipe makes one 9x5'' loaf! Breads/Rolls· Breakfast/Brunch· Dessert· Holiday Treats· Kid-friendly· Snacks/Misc. Delicious! Sweet but not overly sweet! Thanks for the recipe. Oooooh, just discovered your website. I was looking for a broccoli and cheese quiche recipe and I know what I’m cooking for dinner tonight now. Looking forward to trying it. I’ve had a quick peek at your other recipes and feel inspired. Can’t wait to try ‘lemon almond bread’. Will be following your site. Thank you.